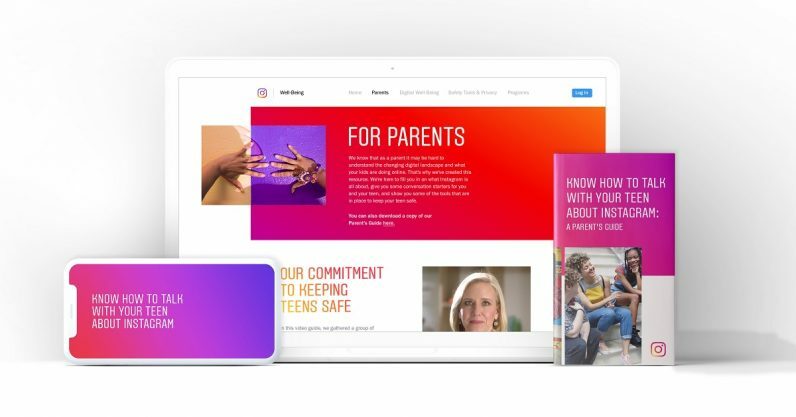 Instagram today published a new guide on its Well-Being center aimed at parents of younger Instagram users. While the resources it offers are very helpful for non-savvy guardians, it doesn’t offer tools for addressing some of Instagram‘s deeper issues and the trouble it can cause young people. For the most part, the material is really basic and assumes the parent knows nothing about Instagram. It’s a good starter kit, even for adults — the app‘s built-in tools for time management are something even I haven’t frequently used, so the details on how to use them are handy. It also provides a handy glossary and a list of questions parents can ask teens about their experiences. Instagram‘s allure for teenagers is on par with its sister app, Snapchat. A Pew study conducted earlier this year showed 72 percent of teens use Instagram frequently, with 15 percent saying its the social site they use most often. That’s an increase of 20 percent from a similar study conducted in 2015. That said, the site’s guide doesn’t touch on some of the deeper issues of teens and Instagram use. Were I the parent of a teenager, for example, one question I’d have would be, “Are there things you post on Instagram you don’t want me to see?” The provided questions touch on the subject of multiple accounts — “If you have multiple Instagram accounts, what do you share in each account?” — but don’t touch on why a teenager might have multiple accounts. It also doesn’t mention how to address and correct self-esteem issues that might arise from extended use of the app. In this year’s Pew Study, 27 percent of teenagers who said social media had a mostly negative effect expressed concern about bullying. 15 percent said they gave users an unrealistic view of each other’s lives. A few of the questions Instagram offers to parents are about bullying — specifically, they propose parents should ask teens, “What would you do if you saw someone being bullied on Instagram?” It’s a fair question, but it fails to take into account how to recognize bullying on Instagram. In a survey published last year by anti-bullying nonprofit Ditch the Label, 46 percent of respondents said, when asked what they considered to be “real,” said they didn’t consider anything online to be so — including Instagram. It might be fair to ask your teenager if they consider things that happen on Instagram to have “real life” consequences. According to COO Marne Levine, the questions were all created with the help of a social media expert and are designed to help parents ensure their kids are using the app in a positive way. While that’s admirable and the questions themselves are a good starting point, there are some areas of the app these questions don’t necessarily open up to non-‘Gram-savvy parents. Instagram‘s guide is a good place for parents to start if they want to learn more about their teen’s favorite app, but it doesn’t cover everything that might be worth addressing. I’m hoping they follow up with some more pointed materials, to help parents probe deeper into how Instagram can be used by kids.